Recently, OFCCP announced it would conduct focused reviews of federal contractors’ Section 503 compliance during its Fiscal Year 2019 scheduling cycle. It is important for federal contractors to take the necessary steps to ensure equal employment opportunity and affirmative action for Individuals with Disabilities. This is the fifth webinar in Berkshire’s Section 503 compliance webinar series. Register today for this webinar on March 20, 2019, at 1:00 p.m. Click here to register and learn more about our other informative webinars in this series. 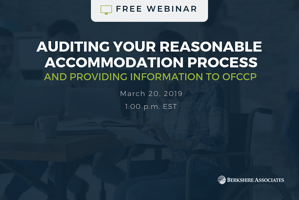 With the help of our compliance experts, each webinar will provide you with helpful information to help you prepare for OFCCP Section 503 Focused Reviews.